Google Labs team has added a new web service which known as Google Fast Flip. Google Fast Flip is a new reading experience that combines the best elements of print and online articles with the ability to “flip” though page online as quickly as flipping through a print magazine. It allows the users to browse sequentially through bundles of recent news, headlines and popular topics as well as feeds from individual top publishers. The users can quickly look through a lot of pages until they find something interesting page and click on that page to load in full page view. Apart of that, it also provides aggregation and search over many top newspapers and magazines, and the ability to share content with their friends and community. 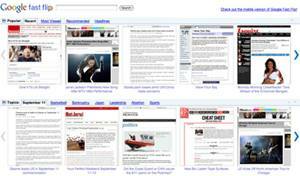 The interface of the Google Fast Flip has been designed to category the news into topics, sections and based on most viewed or recent for improving the browsing experience. The Google Fast Flip can be accessible at fastflip.googlelabs.com. The Google Fast Flip not only targeted to desktop users but also available for iPhone and Android phones users. The mobile users can simply navigating to the Google Fast Flip homepage with their mobile phones to access it.